Fresh air and family fun are the perfect combination for your April Vacation Week plans. Come out and play in your Massachusetts State Parks and enjoy a fantastic array of family friendly programs and experiences for all ages. Enjoy guided experiences or create a park adventure on your own. There is so much to enjoy and explore in your state parks. Come for a visit! Enjoy a Family Spring Storywalk® at Houghton’s Pond Playground. Visit A Salamander Room. Vernal pools and wetlands come alive in spring! Many salamanders and frogs are most active this time of year. Be on the lookout but please do not be tempted to take one home as the little boy in this story does. Read along and see all the things a salamander needs to live. Stroll through the pages of the book posted on the wooden fence at the playground. Add a unique literacy experience to your outdoor fun. Best for families with kids 3-8 years old. Enjoy a self-guided visit through the end of May at 840 Hillside Street in Milton. Co-sponsored by DCR and Milton Early Childhood Alliance. Come get a look at the fully furnished interior of the Ames Mansion, including the ornate two-story library. On this 30-minute guided tour of the home, you will learn about the history of the Ames Mansion and the Ames Family. This is a great tour to familiarize yourself with the unique history at Borderland State Park prior to taking another themed mansion tour. First floor only. For adults and older children. Meet in front of the Ames Mansion. Rain or shine. This program is free and open to the public. Parking fees apply: $5.00 per MA-plate vehicle and $10 per out-of-state-plate vehicle. For more information, call (508) 238-6566. What would it be like to be a kid living in this huge mansion? Join the Park interpreter for this 30-minute interior tour of the Ames Mansion. Program is best for families with younger kids to explore the first floor of the mansion. For all ages. Meet in front of the Ames Mansion. Rain or shine. Grab a brochure of suggested family hikes from the Visitor Center or the Park Interpreter and enjoy a winter walk at the park before or after your tour. This program is free and open to the public. Parking fees apply: $5.00 per MA-plate vehicle and $10 per out-of-state-plate vehicle. For more information, call (508) 238-6566. What would it be like to be a kid living in this huge mansion? Join the Park interpreter for this 30-minute interior tour of the Ames Mansion. Program is best for families with younger kids to explore the first floor of the mansion. For all ages. Meet in front of the Ames Mansion. Rain or shine. Grab a brochure of suggested family hikes from the Visitor Center or the Park Interpreter and enjoy a winter walk at the park before or after your tour. This program is free and open to the public. Parking fees apply: $5.00 per MA-plate vehicle and $10 per out-of-state-plate vehicle. For more information, call (508) 238-6566. Did you know that 100 years ago, when the Ames Mansion was built, women did not have the right to vote? Oakes and Blanche Ames’s involvement in the struggle for women’s rights helped pass the 19th Amendment to the US Constitution on August 18, 1920. During this 30-minute guided tour of the first floor of the Ames Mansion, you will learn about their women’s suffrage efforts and view some of Blanche’s suffrage artwork and political cartoons. First floor only. For adults and older children. Meet in front of the Ames Mansion. Rain or shine. This program is free and open to the public. Parking fees apply: $5.00 per MA-plate vehicle and $10 per out-of-state-plate vehicle. For more information, call (508) 238-6566. Stop by the visitor center, where the staff will have directions and supplies to make your own little greenhouse. Select from different seeds, to make your little greenhouse unique to you. After you plant the little seeds, you will place your little greenhouse inside a Ziploc bag to take home and once the seeds start to sprout, you can transplant them into your outside garden. Supplies are limited, while supplies last. One per person. Rain or shine. Self-guided craft will be hosted inside the visitor center. Children must be accompanied by an adult. This self-guided opportunity is free and open to the public. Parking fees apply: $5.00 per MA-plate vehicle and $10 per out-of-state-plate vehicle. For more information, call (508) 238-6566. Observe live osprey on their nests using binoculars and spotting scope. See them fish in the bay and learn about their life and travels through interactive games. We’ll work together to construct an “osprey style” nest and discover how our own wingspans measure up. Dress for the outdoors. Indoors if raining. For more information, call (508) 457-0495 x 125. Hop on down the Flat Pond Trail in search of signs of our native, yet rare, New England Cottontail Rabbit. Learn what they need to survive and how they differ from the common Eastern Cottontails. Look for signs of spring along the boardwalks and bridges of this beautiful wetland trail. Walk 1 mile, prepare for wet ground in spots. Please park in Bayberry Parking lot on the right, before the Mashpee Town Beach. No facilities on site. Bring water and snack. Rain cancels. For more information, call (508) 457-0495 x 125. Phytoplankton are the base of all aquatic food-webs. Recent research in Waquoit Bay examined how phytoplankton species and their abundance varied throughout the year and various locations throughout the Bay. Come learn about the diverse range of microscopic organisms that live within every drop of water in Waquoit Bay and what they have to tell us about water quality. For more information, call (508) 457-0495 x 125. Join Ms. Jessica, the childrens’ librarian from the Sharon Public Library, and the staff at Borderland for a story by the warm fire. After the story, there will be coloring and crafts for the children. Great for children of all ages, children must be accompanied by an adult. The story hour will be held at the Visitor Center at Borderland State Park. This program is free and open to the public. Parking fees apply: $5.00 per MA-plate vehicle and $10 per out-of-state-plate vehicle. For more information, call (508) 238-6566. Meet at the Houghton’s Pond main parking lot at 840 Hillside Street in Milton. 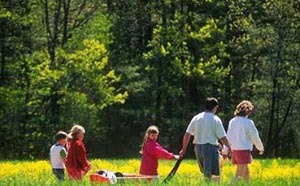 Celebrate spring on a family friendly discovery walk. We will be looking for frogs, birds, blooms, and other signs of spring. Ages 6 and up. Wear sturdy footgear, dress in layers for comfort and carry drinking. We will hike unless the weather is severe. If weather conditions are questionable, call reservation headquarters for updates at 617-727-4573 x 4. Discover this amazing public resource as we tour the grounds, buildings and shoreline at Reserve Headquarters. Examine wallpaper samples from the historic Victorian home and learn how this private summer retreat was transformed into a Massachusetts State Park and a center for scientific research. Enjoy the indoor and outdoor exhibits, Wampanoag wetu structure and waterfront picnic area after the tour. For more information, call (508) 457-0495 x 125. Join Marla Isaac and the Friends of Borderland inside the visitor center to see live reptiles, such as snakes and turtles and much more. Marla will teach us about these reptiles and you will be able to see some up close! This event is sponsored by the Friends of Borderland. Great for kids of all ages, all children must be accompanied by an adult. Rain or shine. This program is free and open to the public. Parking fees apply: $5.00 per MA-plate vehicle and $10 per out-of-state-plate vehicle. In case of inclement weather, or for more information, call (508) 238-6566. Discover the ingredients both living and non that make up an estuary. We’ll explore the shore, test the water, and look for animals along the way. A trailside egg hunt will reveal local animals that rely on estuaries to survive. We’ll end by creating a recipe to fill our estuary soup pot. Meet at the Visitor Center. For more information, call (508) 457-0495 x125. Let’s hike some of the lesser known trails during the spring season at Borderland State Park. Each week we will change up the hike, exploring different trails and areas of the park on these easy to moderate 2 to 5 mile hikes. Dress for the weather, bring water, and bug spray. Hike is easy to moderate in difficulty. For adults and children 13+. Meet at the Visitor Center. This program is free and open to the public. Parking fees apply: $5.00 per MA-plate vehicle and $10 per out-of-state-plate vehicle. Severe and inclement weather will cancel hike, please call ahead to confirm hike is still happening at (508) 238-6566. Join the park staff for a 3-mile stroll under the full moon. We will hike along the Pond Walk trail around Lower Leach Pond. We will stop a few times to enjoy the natural beauty of the park under the moon. We will keep a moderate pace. Great for older children and adults. All children must be accompanied by an adult. After the hike we will meet back at the visitor center to enjoy some light refreshments inside the visitor center; while supplies last. Meet at the visitor center. Dress for the weather and bring a flashlight. This program is free and open to the public. No parking fees for this event; all cars must be out of the parking lot by 9:30pm. Inclement weather will cancel this event. To ensure hike is happening, or for more information, please call Borderland State Park at 508-238-6566. Calling all who love Borderland State Park and would like to give back by volunteering! On Saturday, April 20, 2019 meet at the visitor center to register and we will put you to work either weeding, mulching, planting flowers, trash pickup or any other project needed. Bring gardening gloves or borrow ours and prepare to get a little dirty. We will provide bottled water and light snacks and some hand tools. Together we will make Borderland beautiful and clean. Thank you in advance for your volunteerism. Rain or shine, children must be accompanied by an adult. Park Serve day is co-sponsored by the Department of Conservation and Recreation and the Friends of Borderland. For more information, please call 508-238-6566. Parking fees will be waived for all volunteers for Park Serve Day. Come get a look at the fully furnished interior of the Ames Mansion, including the ornate two-story library. On this 30-minute guided tour of the home, you will learn about the history of the Ames Mansion and the Ames Family. This is a great tour to familiarize yourself with the unique history at Borderland State Park prior to taking another themed mansion tour. First floor only. For adults and older children. Meet in front of the Ames Mansion. Rain or shine. This program is free and open to the public. Parking fees apply: $5.00 per MA-plate vehicle and $10 per out-of-state-plate vehicle. For more information, call (508) 238-6566. Have you ever wondered why Oakes Ames became a botanist and is still considered one of the foremost researchers on orchids? Why did he choose not to follow in his fathers or grandfathers footsteps and operate the Ames Shovel Company, what made him go into the botanical field? Join the park interpreter and learn about Oakes Ames and his contributions to the field of orchid research on this 30 minute tour. First floor only. For adults and older children. Meet in front of the Ames Mansion. Rain or shine. This program is free and open to the public. Parking fees apply: $5.00 per MA-plate vehicle and $10 per out-of-state-plate vehicle. For more information, call (508) 238-6566. Borderland is one of the most historically significant tracts of publicly owned land in the Commonwealth. Created in the early 1900s by artist and suffragist Blanche Ames and her botanist husband Oakes, Borderland offers many of the same pleasures that the Ames family enjoyed. Learn about the family through the park’s exhibits. A variety of self-guided walk brochures are available in the Visitor Center vestibule. Accessible. For more information or directions, please call (508) 238-6566. There is a $5.00 per vehicle parking fee; $10.00 for out-of-state vehicles. Come in from the cold and explore our exhibits along with a host of self-guided, hands-on activities including animal puppets, leaf rubbings, crafts, animal life cycles and more. Accessible. For more information or directions, please call (508) 457-0495 x125. · Most programs are free. If admission is charged, information is in the program description. · Some parks charge a parking fee. If so, information is in the program description. · All children must be accompanied by an adult. · Be season smart and safe. Dress for the weather, dress in layers, and wear sturdy footgear. Consider a walking stick, hat, sunscreen and/or bug repellant. · Carry drinking water, a snack, a map, and cell phone. · Seasonal weather such as heavy rains and storms affect parks and trails. All events, programs and activities are subject to change. Please take a moment to call ahead to confirm. · Reasonable accommodations are available; call in advance to inquire. · Programs are listed chronologically by date and time.